On Time In Full – Tim McLean’s New Book to be Released in April – Pre-order Your Copy Now. 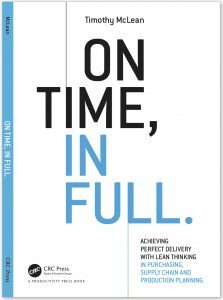 TXM Lean Solutions > News > On Time In Full – Tim McLean’s New Book to be Released in April – Pre-order Your Copy Now. TXM Managing Director, Tim McLean’s new book, On Time, In Full: Achieving Perfect Delivery with Lean Thinking in Purchasing, Supply Chain and Production Planning is due to be released by leading publishers Productivity Press during April 2017. On Time In Full is a practical guide for manufacturers and distributors on how to meet a fundamental requirement – how to deliver to the customer the right product in the right quantity at the right time – every time. While the concept of on-time delivery seems deceptively simple, achieving it can be incredibly complex. This book unravels this complexity and provides simple, practical solutions that will enable every manufacturer to delight customers with reliable, consistent on-time supply at a competitive cost. It covers the end-to-end process of delivering an order to the customer, from understanding customer demand and forecasting, through production scheduling, supply of materials and delivery of finished goods. 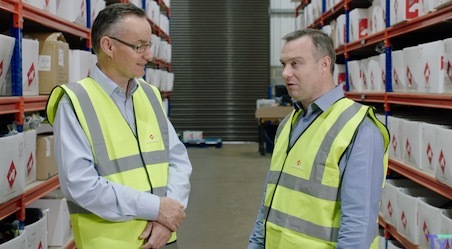 On Time, In Full directly addresses the key purpose of every supply chain – how to deliver to the customer what they want, when they want it in the right quantity. On Time, In Full cuts through the theory and takes a pragmatic approach, looking for the best solutions for different supply chain challenges. On Time, In Full looks beyond the software and the math and examines the human and organisational factors that cause supply chains to fail. including managing supplier and customer relationships. The book is easy to read and talks in clear language about the problems that face supply chain professionals every day – and how to overcome them. The book is structured in clear self contained chapters enabling the reader to select the topics of most interest them.